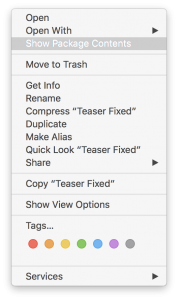 Here’s the steps I took to fix a Final Cut Pro X project when REDcine-X RMD file saves /color changes were not updating Final Cut Pro X. First, I exported my project as a General XML in Final Cut. Next, right click on your Final Cut Project file, and show package contents. Navigate to the Original media folder inside this package. In my case, I noticed RMD files created by Final Cut, and other RMD files with broken aliases. I deleted all the (fcp1) RMD files, and fixed the aliases for the remaining RMD files to point to their original location with the RED media. How you do that step is up to you, I did it manually by re-creating aliases, and dropping them back inside each respective folder inside “Original Media”. I noticed, REDcine-X wasn’t saving RMD files at all. Hmmm … fixing permissions on the RED media folder solves that issue. While I was at permissions, I also fixed permissions to the FCPX project as well. Set everyone to READ/WRITE and propagate permissions on top level folder. Now, open a new Library and IMPORT your XML project. That will copy all the media events and project into the new library. Open your project, grade with REDcine-X and all should update perfectly again.